Unique custom made ceramic mugs for chicken lovers! Custom made ceramic mugs for chicken lovers. 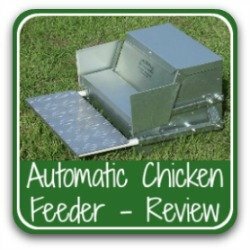 Looking for the perfect gift for the chicken lover in your life? You've found it! Whether it's a gift for a birthday, Christmas, Easter or a special anniversary, one of these mugs could be just what you're looking for. This is my selection of cute, funny and elegant customisable ceramic mugs using pictures I have had designed especially for my products - so you won't find them anywhere else. You can either buy them exactly as you see them or use the 'customise it' option in my store if you'd prefer to use your own photos, images or words. Want a really personal gift? 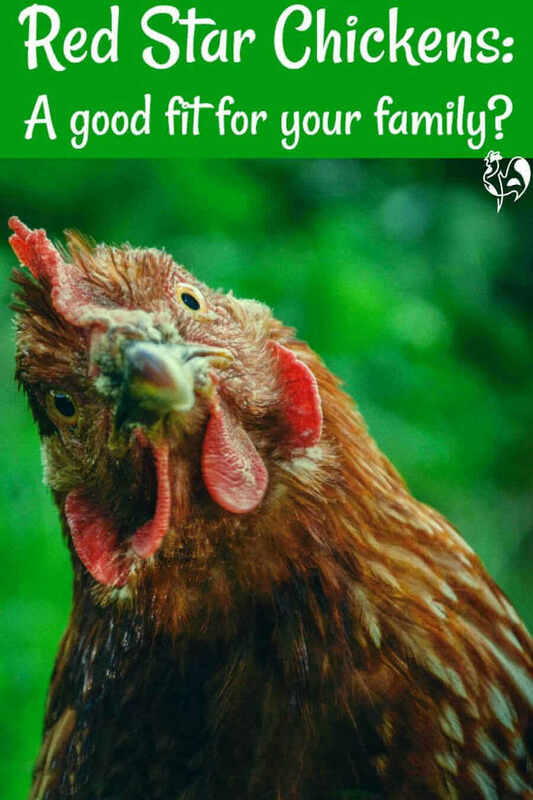 Use a picture of your own chickens, or your friend's. 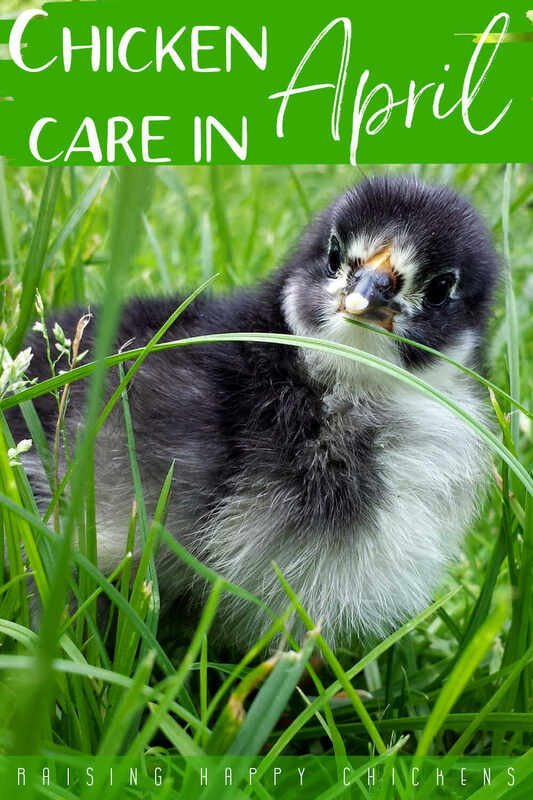 Personalise your message to suit the occasion too: "Happy birthday", "Thank you for looking after my hens!" or simply "I'm glad you're my friend". Choose the image on this page that you like best. 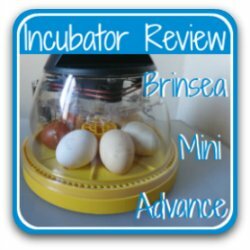 Click on either the picture or the link you'll find in each description. 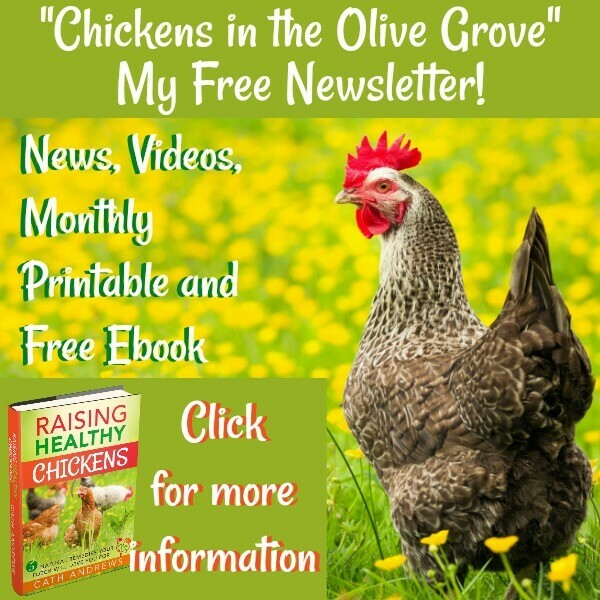 This will take you to my 'Raising Happy Chickens' store on Zazzle. There, you can look at the item in more detail, use the 'customise it' button if you'd like to add your own text, and buy your own custom built ceramic mug. You'll also find other chicken-related products there, all of which you can customise to your own requirements - invitations, postcards, greetings card, tee-shirts and more! It's so easy to do, such a wonderful personal gift. And if you don't like it when you receive it, there's a 100%, no questions asked, return policy. 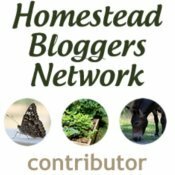 If you purchase a product through links on this page, I receive a small commission at no extra cost to you. I only recommend products I have purchased or would purchase myself and which I believe would benefit you. To learn more please see my disclosure policy. 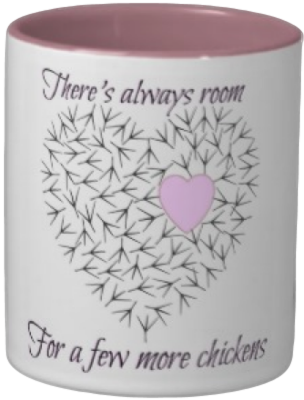 "There's always room for a few more chickens" mug! There's always room for a few more chickens - isn't that the truth? If you know someone who would agree with this, you've just found the perfect gift. It comes in both a customisable ceramic mug and tee-shirt, with a heart made of little chicken tracks and a smaller heart which has just enough room to take a few more. There's no other text on this mug, but to personalise it you can always add your own - there's lots of space for you and it's sooooo easy to do - and you can change the colour, too - just use the 'edit' button on the mug page. To see more, click on the pic or use this link to go straight to my store where you'll find this mug - and lots of others made purely for the chicken-lover in your life. 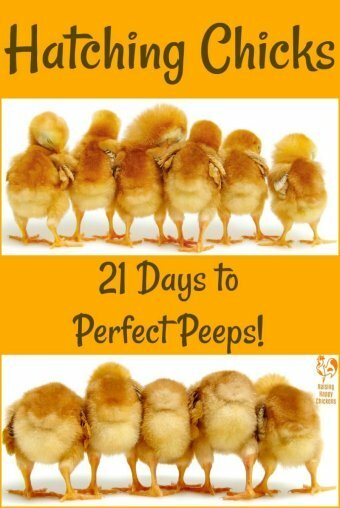 Easter is coming! You need a gift for someone who loves their 'girls' - but chocolate is so last year! This unique ceramic mug shows a mother hen caring for her little newly-hatched cute little chick, both of them standing on a patch of Spring grass under a clear blue sky. The text on this mug reads "Happy Easter, From the chickens, with love" - but you can change that if you would like to write your own custom made message. Just use the 'edit' button in my store. To buy this high quality ceramic mug, click on the image or here to go straight to my store, where you can change the colours, the text or the type and size of mug to suit your own tastes. 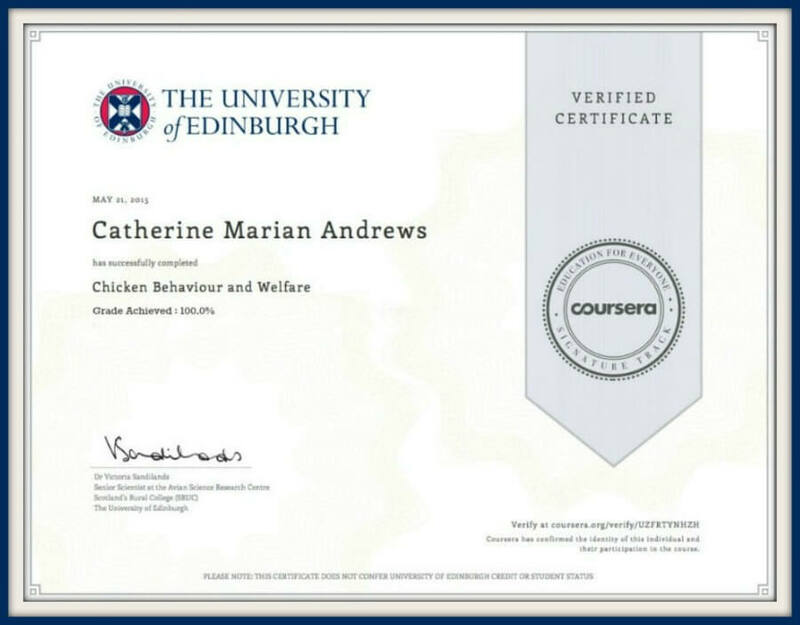 Crazy Chicken Lady - coming through! Do you recognise this lady? Is it you? Or someone you know? 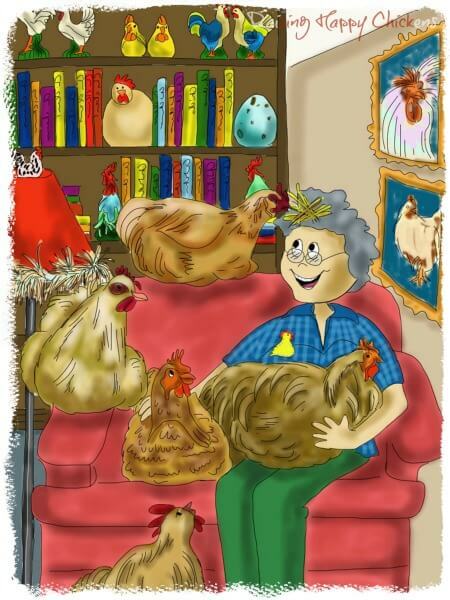 It's a lady with one obsession in her life - her flock! 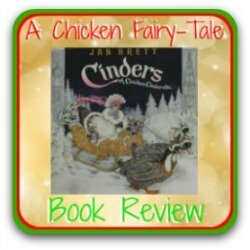 Chicken ornaments, pictures, books - and, of course - chickens! This image was custom drawn for me by children's book illustrator, Sherrie Molitor, and is the only one of its kind so you won't see it anywhere else or on any other products (legally). By clicking through on the image or on this link to my store you'll be able to buy it exactly as it is, or to add your own words. This gives you the opportunity to personalise your ceramic mug for that special person in your life. And I guarantee - whether it's for yourself or for a friend - it will make you smile! 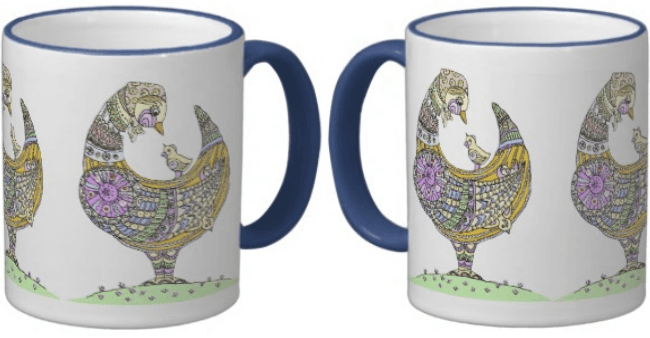 Custom ceramic mugs for the chicken mother in your life! This is one of my favourite images of all time. A mother hen - dressed, as any self-respecting mother hen should be, in a headscarf - looks fondly at the chick hitching a ride on her back. The design is a pretty, modern design yet with such elegance and delicate colours. It will suit anyone who loves their 'girls'. This version of the design has the image repeated three times; there are also versions with one image and some text which you can leave as it is, or change for your own message. Click here or on the image to see more detail and other products you will find featuring the same image. This is an extremely popular, best-selling design, also available on my Easter mug. Enjoy! 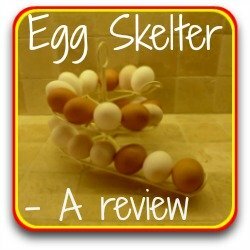 Is your favourite chicken breed a Silkie? Let's be honest - we all have our favourite breeds. Who doesn't love Silkies? Cute, cuddly bundles of fluff! 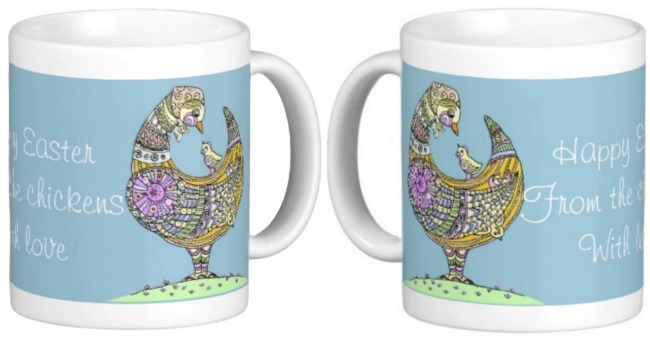 This mug is sure to be a hit with any Silkie lover. Featuring a white Silkie wandering through a bluebell field, the text on the back reads what every Silkie owner knows to be a reality - "My Silkies - My World!". 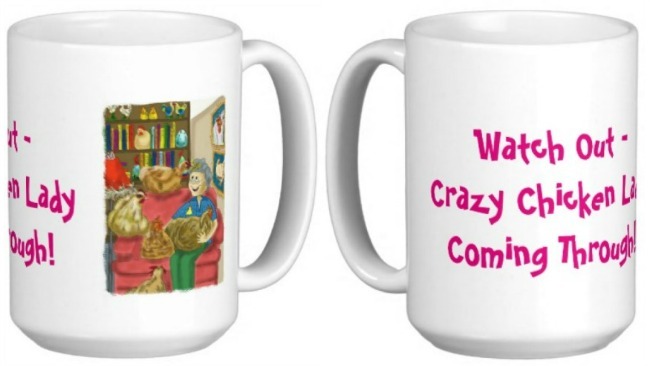 Click on the image or on this link to go straight to my store where you are welcome to change the size or type of mug to suit your needs and, if you'd like to, customise the wording. 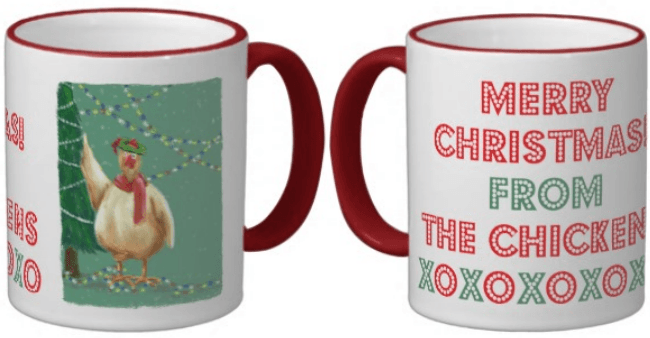 They're cute, they're Christmassy - custom ceramic mugs as Christmas gifts. 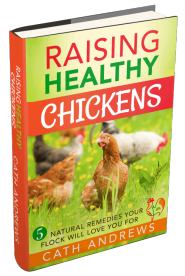 Wondering what to buy the poultry lover in your life at Christmas? 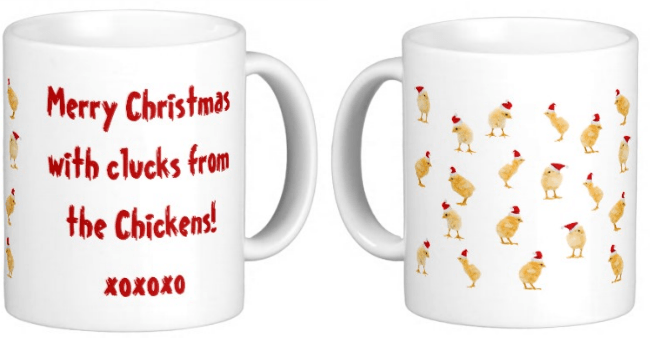 Here's an ideal solution - a "Happy Christmas" coffee mug full of happy Christmas chickens! 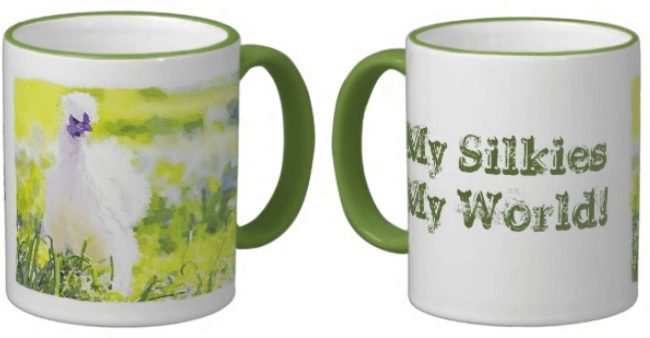 Click on the image or on this link to go to my store where you can choose to have a larger, smaller or differently coloured mug. Keep the text as it is, or make this mug a really personal gift by adding your own text - it's simple to do by using the 'customise it' button at the store. This is an unique image made especially for me by the talented children's book illustrator, Sherrie Molitor - you won't find it anywhere else on the internet or any other person's products (legally). The text on the back of the mug can be left as it is for your convenience, or changed to make your gift even more personal. Who wouldn't like to find this beautiful, high quality ceramic mug under their tree on Christmas morning? Click on the image or here to go to my store to buy. 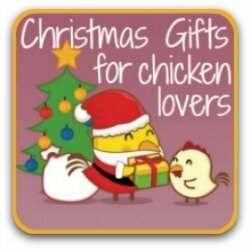 Looking for other gifts for the chicken-lover in your life? Here's a selection for you to choose from. Some are seasonal, some all-year-round. 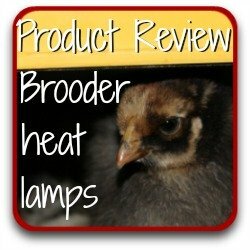 Your choice - just click on a ic to go to that page for my product review.